Every spring, annual crabgrass (Digitaria spp.) invades landscapes across North America. The best defense is a properly maintained lawn, according to the U.S. National Arboretum. This includes proper mowing, irrigation and fertilization. Such cultural controls combined with chemical herbicides can help keep crabgrass in check. As the name implies, gardeners apply pre-emergent herbicides onto their lawns in the spring before crabgrass seeds have germinated. Application methods include liquid sprays and granules. The herbicides stop annual weed seeds, including crabgrass, from sprouting and can effectively break the life cycle of weeds. The University of California recommends products formulated with trifluralin, pendimethalin, benefin and bensulide. 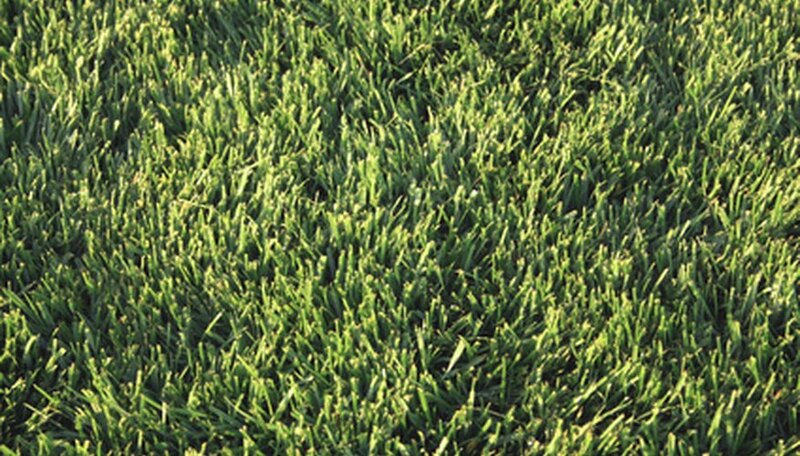 Such products are safe for all established lawns but shouldn't be used within four months before grass seed is spread, according to Colorado State University. Post-emergent herbicides provide effective control of crabgrass that is already present in the lawn. Such herbicides work most effectively on juvenile crabgrass but can also control mature crabgrass with repeated applications. Examples of these herbicides include monosodium methanearsonate, fenoxaprop ethyl and quinclorac, according to Colorado State University. These products give selective control, targeting broadleaf weeds like crabgrass while not killing off turfgrass if applied according to their labeled guidelines. Systemic, nonselective herbicides make quick work of crabgrass–and all vegetation, for that matter. Popular systemic herbicides include glyphosate, glufosinate-ammonium and pelargonic acid. Gardeners must exercise caution when applying these herbicides, since they will kill all plants and not just the crabgrass. This makes them unsuitable for crabgrass control in lawns, but effective in open dirt beds or on sidewalks and pathways. Homeowners worried about the use of potentially toxic chemical herbicides may attempt the use of natural substances as herbicides. These natural herbicidal approaches to crabgrass are typically not as effective as chemical herbicides but may help to kill and control the annual weed. Solutions include hot water, vinegar and sprays formulated with citrus extracts. Such products are nonselective and are usually used as a spot treatment rather than for applying on an entire landscape or lawn.